It is a bizarre turn of events. 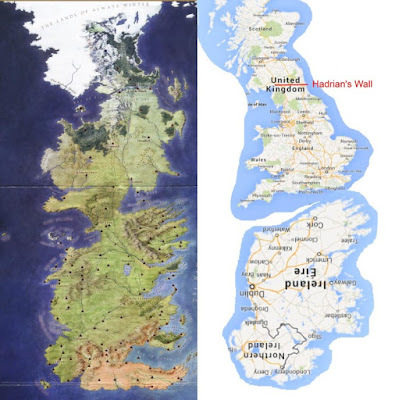 Just like the Game of Throne's Westeros is a map of the UK put on top of an inverted Ireland, so too do UK events seem to be a strange permutation of the pre-referendum views. Although sterling and interest rates have not fully recovered from the Brexit decision, equity markets have, and fear of contagion has died down. Indeed, it appears the UK may not be in the back of the queue from trade deals after all, and the IMF's more pessimistic scenario about the contagious impact has been significantly revised away. Today's news seems consistent with this Brexit-ain't-so-bad meme. The employment report was stronger than expected and the BOE "agents summary of business conditions," which is a bit like the Fed's Beige Book, if a little more formal, found a little impact from the referendum on hiring and investment plans. Two-thirds did not anticipate a negative impact over the next 12 months. There was little evidence of impact on consumer spending or bank lending in the survey. The decline in sterling is seen to benefit exporters, while perhaps also some import substitution. The UK unemployment rate slipped to 4.9% from 5.0% in the three months through May. It is the lowest rate in a little more than a decade. The number of people working increased by 176k, the most this year. The number of jobless fell 54k. The claimant count increased by 400, a tenth of what was expected, but this was negated by the upward revision to the May claimant count to 12.2k from - 400. Overall weekly earnings to 2.3% from 2.0%, but this was a function of bonuses, which, if excluded, slows earnings growth to 2.2% from 2.3%. Sterling had fallen to $1.3065 before the data, a six-day low. It rallied a cent to new session highs, just below $1.3170. The market may need more incentive to take sterling much above $1.3230. The jobs data is nice to know, but it was all collected before the referendum. The BOE survey may be more timely, but it may still be too anecdotal, which means that it is unlikely to alter expectation for the BOE to cut rates and initiate a new asset purchase program as early as next month. Also, even if the immediate impact is less negative than it may have first appeared, it is too early to draw hard conclusions. Investors have already seen pressure in the commercial real estate market. Many new securities give the impression of allowing investors to get exposure in an illiquid asset in some kind of liquid form. Reports suggest that in the dozen days after the referendum, there was a surge in cuts in asking prices on London residential properties, and sales collapsed by nearly 20%. In any event, the recovery of sterling helped the other major currencies pare their earlier losses, which had, incidentally, seen the euro slipped to nearly $1.0980 (its lowest level since 27 June). The divergence meme has underpinned the greenback in recent sessions. Since the start of July, most of the important US economic reports have come in above expectations, suggesting the economy gained momentum. The NY Fed GDP tracker anticipates stronger growth in Q3 than in Q2. The implied yield of the Dec 2016 Fed funds futures fell to 30 bp on the immediate reaction to Brexit and now is quoted near 47.5 bp. Recent Fed comments also suggest that several regional presidents have recovered from their disappointment with the May jobs report, and the fear of Brexit contagion, and once again are sounding hawkish. As we have learned on more than one occasion, the key is still the Fed's leadership--Yellen, Fischer, and Dudley. The other side of the divergence is that idea that several central banks will likely ease in the coming weeks. The economic update from the RBNZ will publish its economic assessment early in Wellington on Thursday (5:00 pm ET today), and it is expected to set the stage further for a rate cut next month. The BOJ meets next week. The IMF trimmed its forecast for Japan's growth this year by 0.1%, which sounds small, and it is, but that proportionately, it is a third, so it now expected 0.2% growth. The dollar is trading at its best level against the yen since June 24. Several technical indicators converge near the high from that day (~JPY106.85). By the end of next month, it is possible that the RBA, RBNZ, BOJ, and BOE ease while, as the Wall Street Journal's Hilsenrath notes, a September rate hike by the Fed may not be so easily ruled out. US equities are likely to follow European bourses higher. The Dow Jones Stoxx 600 is up a little less than 1%, led by information technology and financials. Italian bank index is about 2% higher. Financials in Germany are higher (~0.5%), though it is due to non-banks. The banks in the DAX are off 0.5%, following S&P changing its outlook to negative from stable of the country's largest bank. Stocks in Asia struggled, even though the US Dow Jones extended its advancing streak yesterday to eight sessions, the longest in three years. The MSCI Asia-Pacific Index gained 0.0.5%. Chinese share was mixed, but there has been much interest in the fact that the PBOC set its reference rate for the yuan higher (dollar lower) even though the US dollar firmed against the other currencies that officials say it tracks. The onshore yuan is 0.3% stronger, which looks likely its largest advance in at least six weeks. The offshore yuan is up closer to 0.5%. There has been a suspicion in some corners that Chinese officials are nearing the end of their willingness to let market forces push the yuan down. After being sidelined, the yuan's day-to-day performance (and fix) may become more important again as the market looks closer for policy signals.